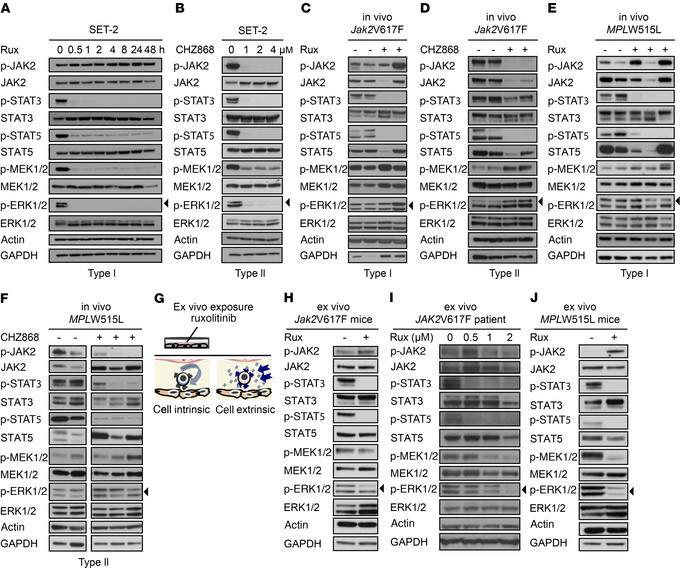 ERK activation is maintained in the presence of JAK2 inhibition in vivo, but inhibited ex vivo. (A) Type I JAK2 inhibition by ruxolitinib at 1 μM inhibits STAT and ERK phosphorylation promptly and over 48 hours in JAK2V617F SET-2 cells (n = 4). (B) Type II JAK2 inhibition by CHZ868 at 1–4 μM for 4 hours dose-dependently inhibits STAT and ERK phosphorylation in JAK2V617F SET-2 cells (n = 3). (C and D) Type I JAK2 inhibitor ruxolitinib at 60 mg/kg (n = 6) and type II JAK2 inhibitor CHZ868 at 40 mg/kg (n = 6) administered orally to primary Jak2V617F mice for 3–5 doses inhibit STAT phosphorylation, whereas ERK phosphorylation is fully maintained in comparison with vehicle-treated mice (n = 6–7). (E and F) Type I JAK2 inhibitor ruxolitinib at 90 mg/kg (n = 16) and type II JAK2 inhibitor CHZ868 at 40 mg/kg (n = 6) administered orally to MPLW515L transplanted mice for 3–5 doses inhibit STAT phosphorylation, whereas ERK phosphorylation remains fully maintained in comparison with vehicle-treated mice (n = 8–13). (G) Schematic of ex vivo experiments. Primary MPN mouse splenocytes were exposed to ruxolitinib at 0.5–2 μM for 6–8 hours to differentiate cell-intrinsic versus cell-extrinsic mechanisms of JAK2-independent ERK activation. (H) Ruxolitinib at 2 μM inhibited STAT and ERK phosphorylation in primary Jak2V617F splenocytes upon ex vivo exposure for 8 hours (n = 4). (I) Ruxolitinib at 0.5–2 μM dose-dependently inhibited STAT and ERK phosphorylation upon 8 hours of ex vivo exposure in PBMCs of JAK2V617F mutant MPN patients (n = 2). (J) Ruxolitinib at 0.5 μM inhibited STAT and ERK phosphorylation upon ex vivo exposure in splenocytes of MPLW515L transplanted mice for 6 hours (n = 9) as compared with vehicle-treated mice (n = 8).